Public Eye Group | At UN, Kenya’s Request for ICC Deferral Dies a Quiet Death, Would Sudan’s? At UN, Kenya’s Request for ICC Deferral Dies a Quiet Death, Would Sudan’s? UNITED NATIONS, March 18 — The UN Security Council will not vote for any deferral of International Criminal Court proceedings against the Kenyan indictees, Inner City Press learned Friday outside the closed Council meeting on Kenya’s request. The meeting on Kenya’s request was otherwise scarcely noticed or notified at the UN. “It wasn’t even in the UN Journal,” one diplomat said to Inner City Press. Ironically, one Western Permanent Representative told Inner City Press that one good thing about the session is that it was “open.” It was a closed meeting, with little notice or coverage. Would the same happen to a request by Sudan’s Omar al-Bashir and Ahmed Haroun? Watch this site. UNITED NATIONS, March 16 — A week after a delegation from Kenya delivered a pitch for deferral of International Criminal Court cases to UN Security Council members and reportedly Secretary General Ban Ki-moon, the Council was scheduled to meet on the topic on Wednesday afternoon. Inner City Press was in front of the Council, seeking to cover the Kenya meeting as well as the Council’s ongoing consultations on Libya. The sign in front of Conference Room 8 next to the Council chamber advertised the Kenya ICC meeting all morning. “When it is rescheduled for?” Inner City Press later asked the Kenyan. It hasn’t been, they answered. But no read out was ever given. 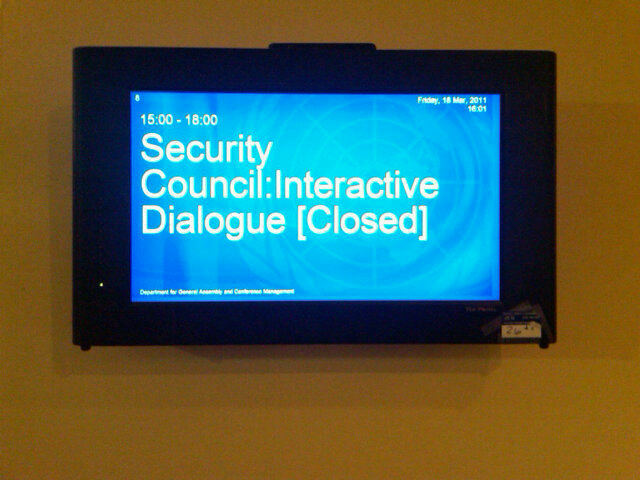 And now the Security Council’s meeting on Kenya and the ICC has been canceled.